The final Second Doctor instalment of The Lost Stories range again comes from the mind of Brian Hayles, returning to his most enduring creations and offering an origin story of sorts for the Ice Warriors. Landing on Mars in a time that should be before the Ice Warriors roamed its surface, the Doctor, Jamie, and Zoe soon discover a plan beneath the surface that will result in the creation of a terrifying army composed of a very familiar foe. As the true lords of Mars emerge and the secret within the Gandoran mines is revealed, both the bonds of friendship and of loyalty to command will be tested. ‘Lords of the Red Planet’ was originally intended for season six following the previous season’s successful introduction of the foes in ‘The Ice Warriors,’ but it was ultimately bypassed in favour of ‘The Seeds of Death.’ Within that context, it’s quite interesting that a genesis story was already a consideration for the Ice Warriors, especially since even the mighty Daleks had not received one at that point. Of course, with the implication that the beings created here are possibly not the true first Ice Warriors, what is instead presented is a fascinating look into the distant past of Mars, its underground colony of Gandor led by its self-appointed leader, Zaadur, and the scientist Quendril’s attempts at finding the forced evolutionary step that will allow his people to eliminate their reliance on the life drink. While it’s a bit strange to hear the Doctor make mention of the Ice Warriors’ sense of honor since that did not feature in the debut story, it’s incredibly enjoyable to hear the Doctor and Jamie accidentally create the moniker of Ice Warriors precisely because of that previous adventure. And even if Aslor as the first Ice Lord is the only one of his fledgling race to really distinguish himself from the rest of the pack, ‘Lords of the Red Planet’ makes the most of his very atypical, honor-bound relationship with Zoe to drive the narrative forward with an emotional thrust. This forms a nice dichotomy with the other main relationship on display, that between the devoted Rislar and the Princess Veltreena, and puts into context the narcissistic stylings of Zaadur which Abigail Thaw plays perfectly. 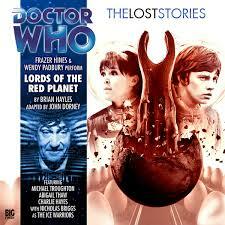 ‘Lords of the Red Planet’ is a bit different from most of the early era entries in The Lost Stories in that it relies much more exclusively on performances rather than on a blend of narration and voice acting, employing the talents of four actors in addition to the usual stalwarts of Frazer Hines and Wendy Padbury. Hines’s ability to evoke the mannerisms of Patrick Troughton’s Second Doctor again cannot be overstated, and both original cast members’ abilities to channel their younger selves in certainly impressive in its own right, lending a great sense of energy and enthusiasm to a story that sometimes runs into some pacing issues with its extended six-episode running time. Still, the talents of Abigail Thaw, Michael Troughton, Charlie Hayes, and Nicholas Briggs round out a strong cast that helps to easily steer the story through to its fittingly inevitable end. So although the serial may not quite be the Ice Warriors’ true origin story as expected, it nonetheless offers a thrilling look into what may come to be during a tumultuous time well before the Ice Warriors naturally came to be. Though the pacing and rather straightforward nature of the script keep ‘Lords of the Red Planet’ from reaching true classic status, the strong performances, sound design, and direction help to create yet another strong entry in The Lost Stories that further fleshes out the long and mostly unexplored history of Earth’s neighbouring planet to great effect.